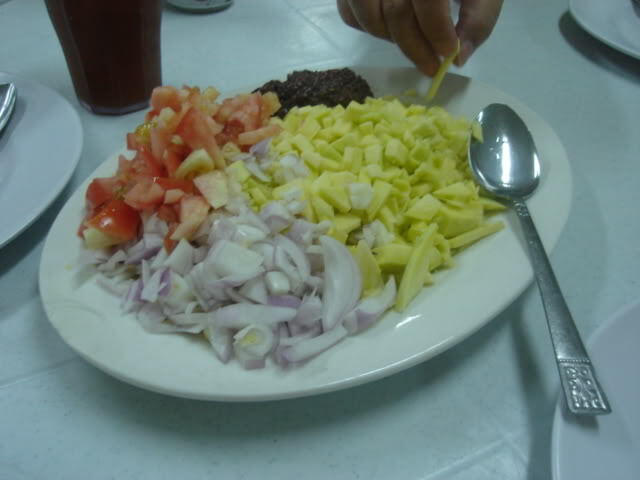 A salad made with the unripened “Queen of Philippine Fruit”. 1 Toss all the ingredients together and serve. Note: To make salted eggs, place 3/4 cup (12 tablespoons) salt into a pan, add a dozen eggs in the shell and enough water to cover. Boil for 2 minutes, then transfer the eggs to sterilized jars and add the boiled salted water to fill the jar. Seal well and set aside for 11/2 months. Always cook the salted eggs before using. Salted eggs are available from supermarkets.